﻿ Zechariah 12:10 "I will pour out on the house of David and on the inhabitants of Jerusalem, the Spirit of grace and of supplication, so that they will look on Me whom they have pierced; and they will mourn for Him, as one mourns for an only son, and they will weep bitterly over Him like the bitter weeping over a firstborn. I will pour out on the house of David and on the residents of Jerusalem a spirit of grace and of supplications, and they will look to me the one whom they pierced.'" And I will send down on the family of David and on the people of Jerusalem the spirit of grace and of prayer; and their eyes will be turned to the one who was wounded by their hands: and they will be weeping for him as for an only son, and their grief for him will be bitter, like the grief of one sorrowing for his oldest son. And I will pour upon the house of David and upon the inhabitants of Jerusalem the spirit of grace and of supplications; and they shall look on me whom they pierced, and they shall mourn for him, as one mourneth for an only son, and shall be in bitterness for him, as one that is in bitterness for his firstborn. 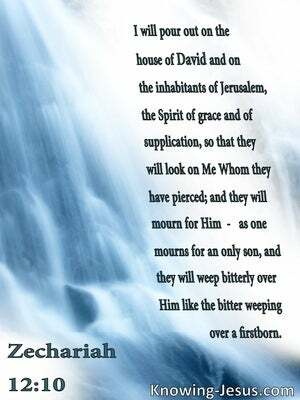 And I poured out upon the house of David and upon the inhabitants of Jerusalem the spirit of grace and supplications: and they looked to me whom they pierced, and they mourned for him as mourning for the only begotten, and being embittered for him as being embittered for the first-born.
" 'I will pour on the house of David and on the inhabitants of Jerusalem a spirit of grace and supplication, and they will look to me whom they pierced, and they shall mourn over him, as one wails over an only child, and they will grieve bitterly over him as [one] grieves bitterly over a firstborn. 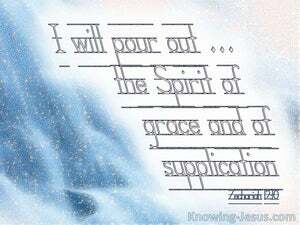 And I will pour on the house of David, and on the people of Jerusalem, the spirit of grace and of prayers. And they shall look on Me whom they have pierced, and they shall mourn for Him, as one mourns for his only son, and shall be bitter over Him, as the bitterness over the first-born. But I will pour out upon the house of David and upon the inhabitant of Jerusalem, the spirit of favour, and of supplications, and they will look unto me, whom they have pierced, - and will wail over him, as one waileth over an only son, and will make bitter outcry over him, as one maketh bitter outcry over a firstborn. And I will pour upon the house of David, and upon the inhabitants of Jerusalem, the spirit of grace and of supplications: and they shall look upon me whom they have pierced, and they shall mourn for him, as one mourneth for his only son, and shall be in bitterness for him, as one that is in bitterness for his first-born. 9 "And in that day I will set about to destroy all the nations that come against Jerusalem. 10 "I will pour out on the house of David and on the inhabitants of Jerusalem, the Spirit of grace and of supplication, so that they will look on Me whom they have pierced; and they will mourn for Him, as one mourns for an only son, and they will weep bitterly over Him like the bitter weeping over a firstborn. 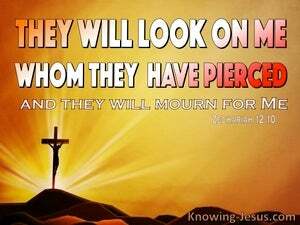 11 "In that day there will be great mourning in Jerusalem, like the mourning of Hadadrimmon in the plain of Megiddo. O daughter of my people, put on sackcloth And roll in ashes; Mourn as for an only son, A lamentation most bitter. For suddenly the destroyer Will come upon us. "In those days and at that time," declares the LORD, "the sons of Israel will come, both they and the sons of Judah as well; they will go along weeping as they go, and it will be the LORD their God they will seek. "And as I began to speak, the Holy Spirit fell upon them just as He did upon us at the beginning.